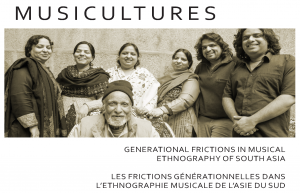 We are very pleased to announce the publication of the most recent issue of MUSICultures (44-1), a special issue on Generational Frictions in the Musical Ethnography of South Asia guest edited by Dr. Margaret E. Walker (Queen’s University) and Dr. Kaley Mason (Lewis & Clark College). This issue is available to current members of the Canadian Society for Traditional Music (non-members can freely access issues more than 3 years old). Or become a member – it’s easy! Or check your library for access.